Marianne Faithfull’s relationship with London has always been complicated. So it’s no surprise that the title of her staggeringly good new album is laced with irony. Give My Love to London is no billet doux of rapprochement to a city that has been responsible for a fair few of her battle scars over the years. But as it ranges freely across the landscape of experience, the record – a truly majestic piece of art – balances moments of bleakly dispassionate observation and cold rage with flashes of compassion, tenderness and dizzying joy so effectively that it is impossible to escape a poignant underlying sense of conflicted affection. Like so many artists before her, Faithfull has discovered in London an infinitely versatile metaphor for the betraying or exalted lover, the progress of an affair, the drug addict, or a society in crisis. But making the metaphor work so fluently is another matter, and her considerable achievement here is to render her subject with such fresh and resolutely contemporary inflections. In the title track, the city morphs from a moonlit playground to a rioting conflagration. This ambivalence is displaced by fragile hope in the moving Roger Waters composition, “Sparrows will sing”. Faithfull’s collaborations with songwriters including Anna Calvi (“Falling Back”, a richly anthemic, imperious pop song), Nick Cave (the poignantly fragile “Deep Water”) and Patrick Leonard (the ferocious “Mother Wolf”) give the album its assured foundations. Cave has also contributed a mini classic in “Late Victorian Holocaust”, a psycho-geographical tale of child heroin addicts; almost 50 years after her introspective, faltering treatment of Donovan’s “Sunny Goodge Street”, Faithfull is back on familiar territory, older and a whole lot wiser And there are lovely interpretations of the Everlys’ “The Price of Love” and the wry Leonard Cohen/Patrick Leonard ballad, “Going Home”. The musical shifts are as eclectic as the songs. Grand, baroque walls of guitar-driven rock give way to blues riffs, folk tropes, classical pianos and harps. That the album gels so perfectly is due in part to the production (take a bow Rob Ellis and Dimitri Tikovoi), and Flood’s mixes, which brilliantly define Faithfull’s vocals so that whether she is declaiming and intoning like a great 21st-century diseuse or singing in that scarred contralto, she is always a match for a band that plays up a storm. 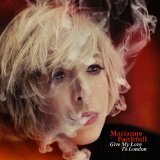 But perhaps more than anything, Give My Love to London is a triumph for Faithfull’s own artistic conviction and self-confidence, which seem to have peaked just as she celebrates 50 years in the music business. Faithfull has made it clear that she has no intention of coming home from the Parisian eyrie where she now lives. But as she concludes in a stark, beyond-despair reading of Hoagy Carmichael’s “I get along without you very well” – here, a torch-song to the city she has just dissected so eloquently – there is a bond that will always be able to reassert itself with the stabbing precision of a stiletto blade. And in Faithfull’s case, like the irritating piece of sand that leads to the creation of a pearl, it has provided the inspiration for a masterpiece. ← Album review – Kristyna Myles: Pinch Me Quick!